“Are you watching closely..” is the opening voiceover of the “The Prestige”, which is a magician’s line often used to distract the audience from something else which might be going on. “The Prestige” is a puzzle from start to finish and an under-appreciated brain-teaser. 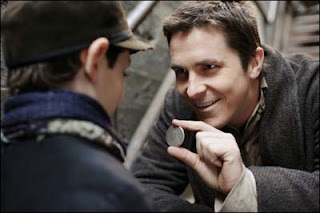 Much of its thunder was stolen by the ‘other’ magic film, “The Illusionist,” released 2 months prior, but believe me “The Prestige” is the one to see. Hugh Jackman and Christian Bale play dueling magicians in turn-of-the-century London, one polished and upper-class, the other streetwise and ‘common’ - like David Copperfield vs. David Blaine? They are both equally determined to succeed in the art. They begin as partners until a fatal accident turns them into rivals. The rivalry escalates as they perform similar tricks, trying to one up each other with each new trick. They even infiltrate each other’s shows to discover their secrets and sabotage their performances. When a new scientific technique is discovered by Nikolai Tesla (a real person, who once had a rivalry with Thomas Edison) which appears to perform “real magic”, both Jackman and Bale desperately want his secrets and will do anything to get it. But Tesla will only give the secret of his experiments to one man, and Christian is the first. Or is he? When Bale is imprisoned (for events I won’t reveal) Jackman steals Tesla’s secret and uses it in his show. Is Tesla’s device real magic or not? “The film’s title refers to the final act of a magic trick where the disappearing object comes back. And what price do our magicians pay to keep the “prestige” of the trick secret. It’s a magnificent finale that keeps the viewer guessing up to the final shot – and what a doozy that final shot is. Like Nolan’s other cryptogram, “Memento”, the film is told out of sequence, with a myriad of flashbacks. It isn’t until the final act that you start piecing the timeline together and learn the true motivations and actions of the characters. Nolan is a magician himself, hiding information and revealing them only at the right time. The film has so much going on it’s a great exercise for the brain. Not only are we bombarded with a thick plot filled with lots of twists and turns, there’s a history lesson of the real-life Tesla/Edison feud, you can learn some behind-the-scenes trickery real magicians use, there’s a love triangle, as well as a cutthroat blood feuds of grand preportions. The cast of Jackman, Bale, Michael Caine, Johansson, a cool-as-ever David Bowie, Rebecca Hall and Andy Serkis are a joy to watch. As expected the production design, cinematography and mood-inspiring music are top-notch. With this film Christopher Nolan asserts himself as one today’s best filmmakers. Just released on DVD, this film is waiting for you to rent it. Enjoy. The last time I saw David Bowie in a film he was wearing spandex, throwing a baby through the air, and singing to/about a young Jennifer Connelly and her infant brother. Honestly, I have to say I liked this version of him much better. Definitely one of the most underrated films of 2006. How it didn't get nominated for editing or adapted screenplay is a mystery to me. Also, the critics seemed to not appreciate it so much, giving Nolan the weakest reviews of all his films (see rottentomatoes.com). Did The Illusionist steal some of its thunder? Too bad. A brilliant movie and much, much better than the Illusionist.